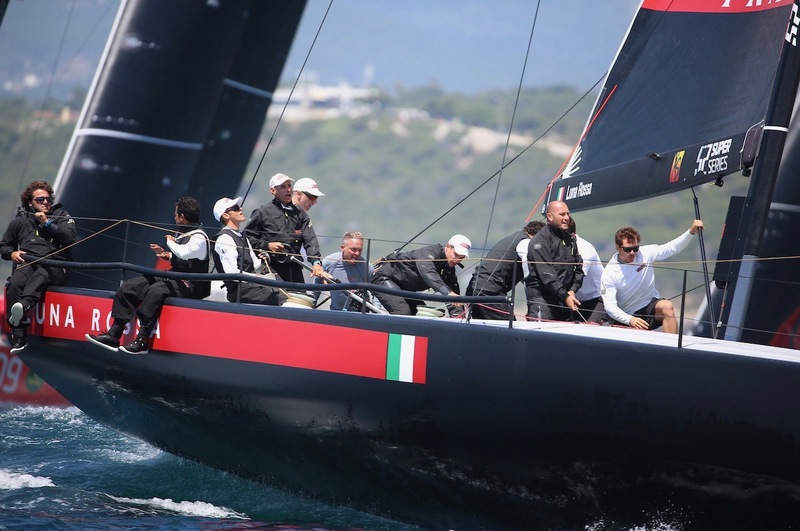 Holding high expectations after winning the Royal Cup in Zadar, Croatia last month, the opening day of the Rolex TP52 World Championship proved to be a big disappointment for the Luna Rossa team. A hydraulic failure less than one minute before the start of Race 1 doused their hopes immediately. And in the second breezy race – the windiest they have sailed as team – they struggled to find speed and balance to be competitive in the 20-28kts winds and waves. But Patrizio Bertelli’s emblematic America’s Cup team showed equal measures of fighting spirit, finesse and competitive edge as top boat for the day, going 1,3 to claw their way back to fourth overall on the world title leaderboard, chasing Quantum Racing who, after four races, are two points clear at the head of the fleet. Luna Rossa led all the way round the course of the first windward-leeward race after executing a swift start from the pin-end-biased line. 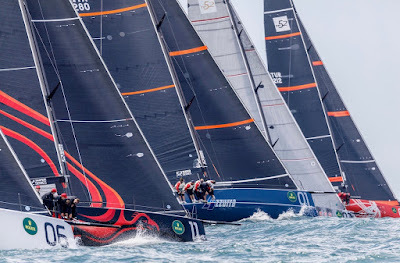 Almost as if to go one better Andy Soriano’s Alegre then delivered a very sweet port tack start to the day’s second race – an extended three leg, 12-mile windward-leeward loop – to win their third race of the season, and so hold third place overall. Winds were slightly less than Tuesday’s blustery reminder of Cascais at its best. With 15kts on the start line of Race 3 of the series, there were different lanes of pressure, and the simple maxims that usually hold true on what is often considered a one way racetrack did not necessarily hold true 100% of the time. There were still opportunities for gains and losses, and once again mechanical failures or human errors – especially on kite hoists – proved costly. Hard-earned gains evaporating painfully in a matter of seconds. Vasco Vascotto and Jimmy Spithill, along with navigator Francesco Mongelli showed how to use the favoured left end of the line and today having the speed to get across the fleet and then set up for a perfect layline to the first turn, forcing others to stand on and sail more distance and others to double tack. 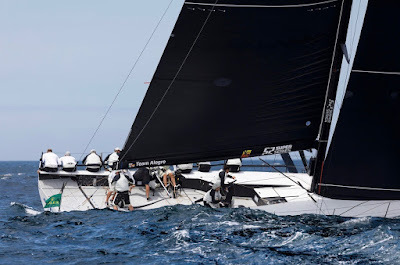 They led around the first turn with sister-ship Azzurra, a very close second with Onda third. 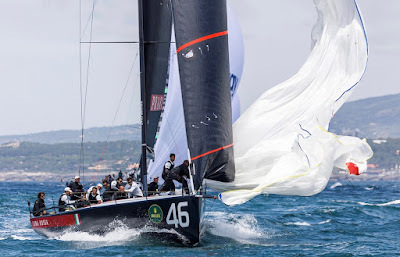 Provezza made a useful gain on the downwind to pass Quantum Racing to get up to third but then annulled that with a spinnaker problem on the next run. 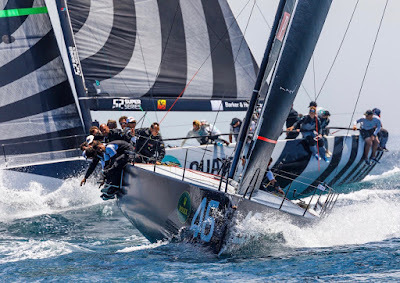 So with Luna Rossa winning, Azzurra second and Quantum Racing third, it was Azzurra topping the table by a single point. The fleet clustered at the committee boat for the second race start, but it was Alegre that had the brains and the balls to run down the line to use the left-end bias, tack on the gun and cross the fleet on port tack. That gave them a useful early lead and on the start of the first part of a six-mile run, they were around 100 metres clear. Ray Davies and Adam Beashel called the early gybe for Sled on the downwind and by the leeward gate they were second, close to Alegre. Azzurra opted for the middle-right of the run and lost significantly, dropping from fifth and challenging at the top mark to cross seventh. After four races sailed so far it is Quantum Racing leading on ten points, Azzurra now are on 12 and Alegre – very much in contention – on 14. 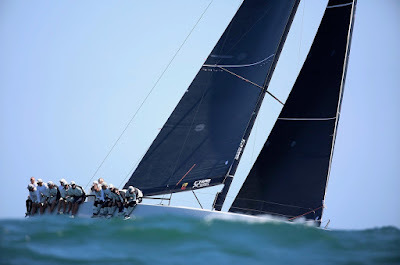 Racing is streamed live every day from 15 minutes before the start at www.52SUPERSERIES.com and via the App. 1. Quantum Racing (USA) (Doug DeVos) (2,1,3,4) 10 p.